The U.S. EPA R/V Lake Guardian, moored since September of last year, is set to sail again at the end of March. Yet it’s been anything but quiet for the EPA’s largest research vessel on the Great Lakes. For now, 14 lines still tether the boat to a dock in the port of Milwaukee near the University of Wisconsin while bubblers move the frigid water around the hull to prevent ice accumulation. A laundry list of repairs has also been underway from routine maintenance like painting and replacing filters to high-ticket items like new bridge electronics and a larger davit, the crane that’s used to lift the lifeboats. All the boat is waiting for now is the seasoned captain to take the helm again. Ask him for his last name and he spells it out, “M-A-L-L-A-R-D—just like the duck,” yet after a career on the water spanning almost 39 years, everyone knows him as Capt. John. Find more information about the boat itself and its schedule at the U.S. EPA R/V Lake Guardian website. On the off-season, home is Michigan with his wife of 32 years. They spend time traveling and visiting family in Germany, where his wife is from. Even when he’s not on the water, he never stops moving. Capt. 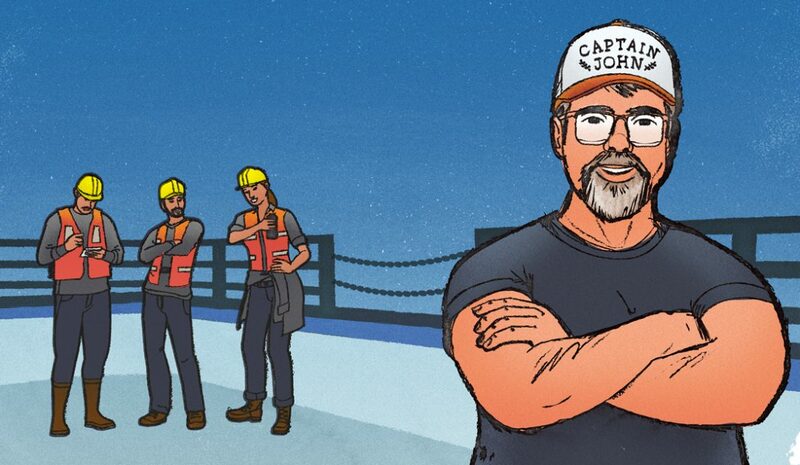 John first joined the Lake Guardian as a second mate in 2010 after years spent on vessels traveling all over the world, including supply boats for oil exploration in the Gulf of Mexico. In a way, the same is true for the Lake Guardian. Until 1990, when the EPA purchased it, the Lake Guardian served as a supply boat to offshore oil rigs in the Gulf. The former lives of the ship and Capt. John make what they’re doing now that much more compelling. They no longer capitalize on this natural resource; they work to protect it. Every year, the Lake Guardian visits all five Great Lakes and performs two water quality surveys, first in March and April and then again in August. Throughout the season scientists book time on the boat to sample, test, scoop, analyze, and measure as much as they can get their hands on—that includes the water, sediment, air, and the aquatic species that call the lakes home. 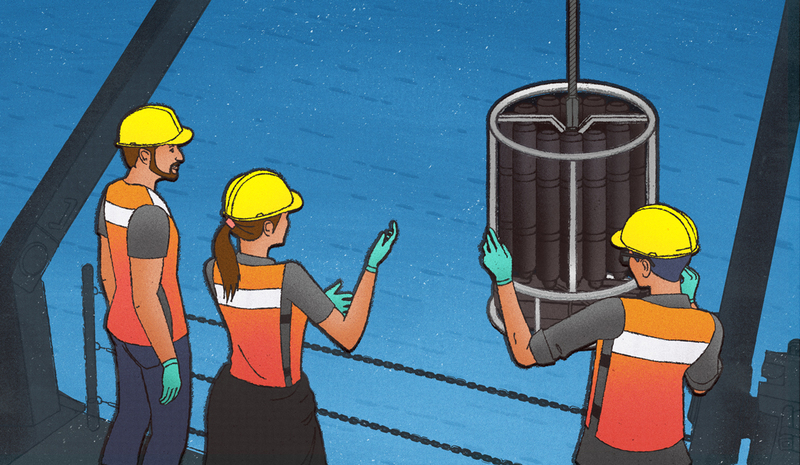 The boat is busy and always jam-packed with working scientists. 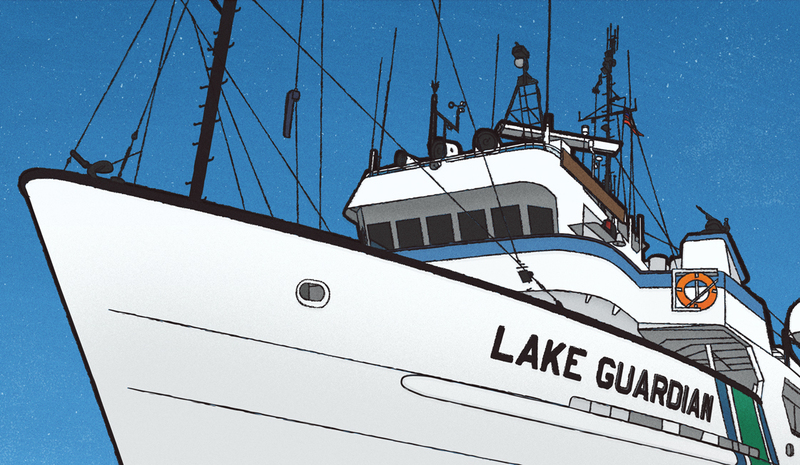 From March through September, the Lake Guardian travels 12,000 to 14,000 land miles—two thirds of that with Capt. John at the wheel. That translates to about half way around the Earth at the equator. In fact, that’s the biggest difference he’s noticed in the six years he’s been with the boat. It’s a lot more in demand. Capt. John considers himself from everywhere and nowhere. Born in Detroit and raised in a military family that was stationed all over, he’s continued that lifestyle on the water. At 66, he has no plans to slow down. Check out our 2014 video interview below with Captain John when he started as first mate!